EASTERN EQUINE ENCEPHALITIS (EEE) has claimed its third victim of the year in Polk County, and officials are recommending that horse owners take precautions, as more cases are expected. A six-year-old Arabian, with no EEE vaccine history or recent travel, began showing clinical signs on June 19 and was subsequently euthanized the same day. It’s the seventh EEE case in Florida for 2016. The first case of the year was also reported in Polk County back in April, when an 18-month-old, unvaccinated American Quarter Horse that had not left the property the last six months, was diagnosed. Clinical signs began April 4 and the horse passed away on that same day. EEE is a more severe mosquito-transmitted disease than West Nile Virus (WNV). The mortality rate for horses with West Nile Virus is about 30 percent, while the rate for EEE is greater than 95 percent. An increase in cases is avoidable. “It’s absolutely coordinated to the vaccination activity,” says Dr. Maureen T. Long, associate professor in the Department of Infectious Diseases and Pathology at UF College of Veterinary Medicine, in response to the recent diagnosis. 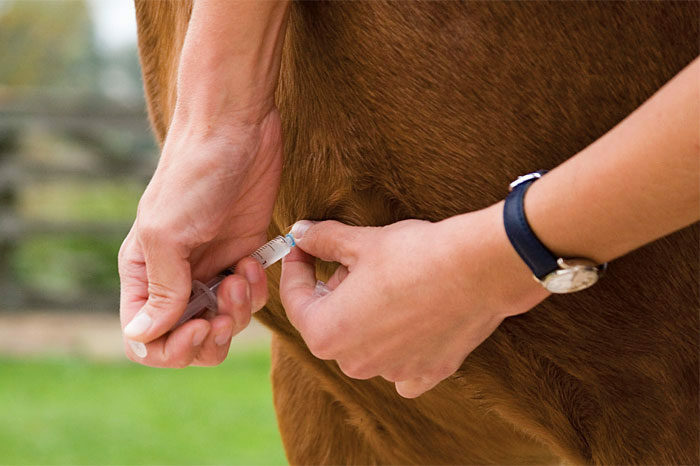 Dr. Long adds there is no reason to refrain from vaccinating horses at least twice a year. In fact, during a year such as this, when mosquito populations got an early start thanks to the wet winter; she recommends three vaccinations for younger horses. Dr. Long points out that in fully vaccinated horses, there is rarely ever a vaccine break. She says the virus is usually found in younger horses, which either have not been vaccinated or have been minimally vaccinated and don’t have the duration of immunity they need to get through a season in Florida. “If you’ve got a 12-year-old horse that’s seen the vaccine twice a year all its life, it’s got lots of protection,” she explains. But the younger horses don’t always get three rounds during their foal vaccinations, and they can have interference from their colostrum from mares. Dr. Long points out that many young horses don’t get a booster until a year from the time they are weaned, which is mid-summer, and that booster does not provide enough vaccination in time for peak season. “Any horse over six months right now needs to be vaccinated,” Dr. Long advises. She also recommends that owners get a definite diagnosis to help officials keep track of the virus. Infected mosquitoes are cited as the primary source for EEE. The deadly virus causes inflammation or swelling of the brain and spinal cord. Common symptoms include head pressing, convulsions, lack of response to facial stimulation, a fever of 103 degrees or more, and ataxia, or the loss of full control of bodily movements.